This smoked, yogurt marinated beef roast was served for Cindy’s birthday dinner, where I wanted to do something very tasty, a bit unusual and didn’t require hovering over the stove in the kitchen for a long time, as we were busy with catching up in the office after two successive weekends presenting at gardening shows. We are fortunate to have some locally raised beef that is delicious in its own right, so that made a perfect base on which to build. I was perusing one of the newer issues of Saveur magazine and came across the dessert idea – a baked yogurt tart – and saw the recipe for grilled yogurt marinated lamb chops. 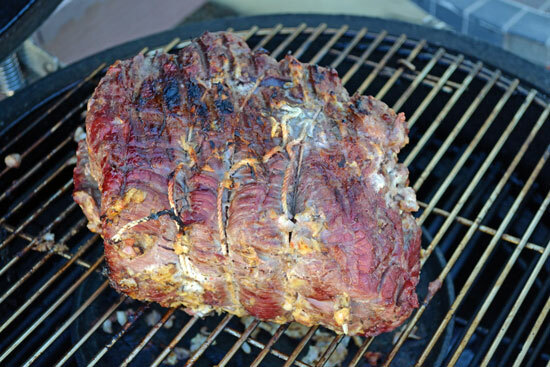 This is our version, slow roasted and smoked over mesquite charcoal in a Kamado, or Japanese ceramic grill. I roasted this at about 300°F for just a bit over 2 hours, as grass-fed beef shouldn’t be cooked as long as conventionally raised beef roast. 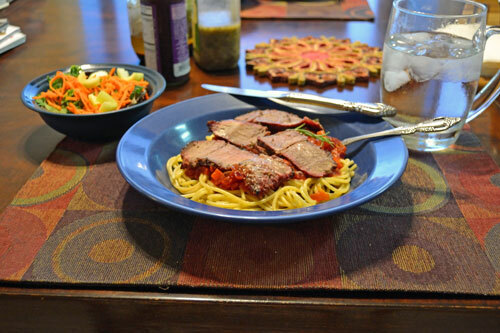 The results were fabulous – the beef roast had a rich, smoky beef flavor that is missing in store bought beef, followed by the tangy, complex flavors of the marinade. Prepare this in the morning and roast it in the afternoon, planning about 2 – 3 hours for the roasting, depending on the size of your roast. 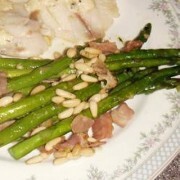 This is the perfect centerpiece for an impressive and delicious dinner that won’t take all of your day to prepare! 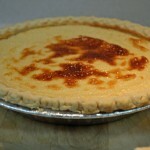 Scroll down after the recipe for photos showing the process. 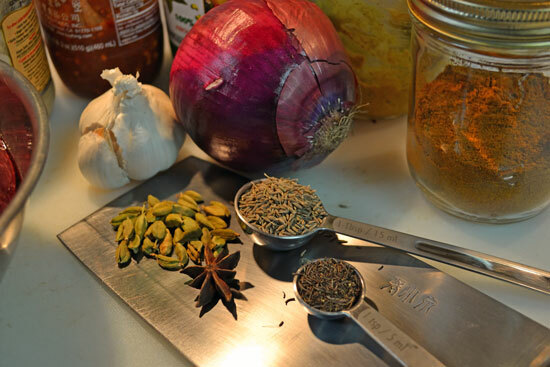 Here’s what could come out of your garden for this recipe – Onion and Cumin, along with garlic you’ve grown! 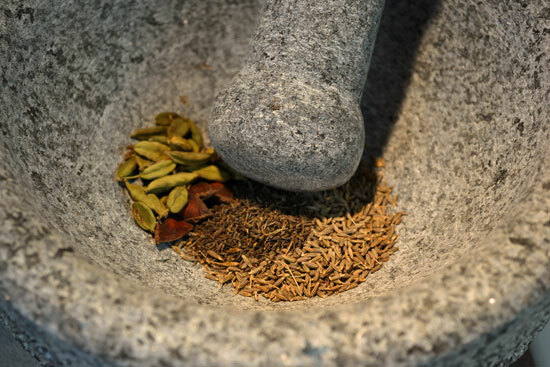 Grind cumin, green cardamom, caraway, star anise in a mortar and pestle. Add to mixing bowl with yogurt. 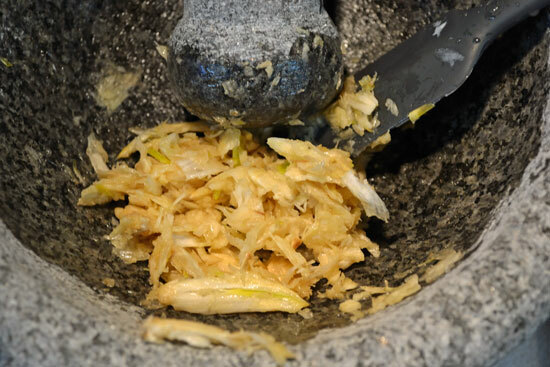 Peel and crush garlic into a paste in mortar and pestle. 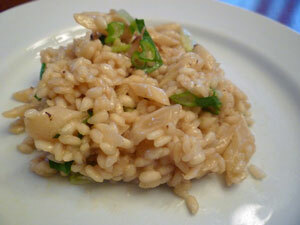 Stir yogurt, freshly ground spices, garlic paste, zest and lemon juice in a bowl. 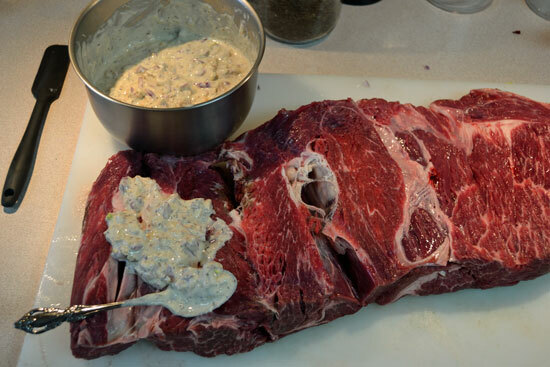 Butterfly beef roast in a circular cut about 1 inch thick, lay open and spoon yogurt marinade over, leaving a small amount for the outside. 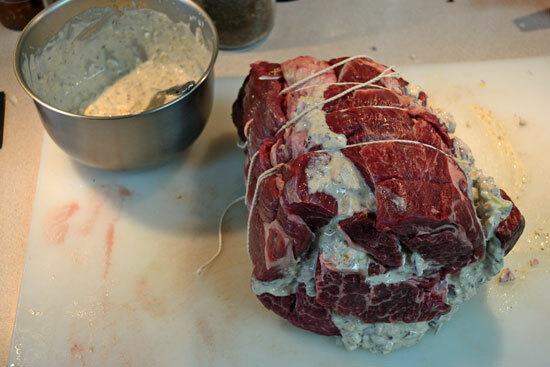 Roll up and tie with butcher's twine, spoon remainder of marinade on outside. Cover with foil, marinade for 4 hours in refrigerator. Heat charcoal or covered gas grill to medium. 300°F is target temperature. 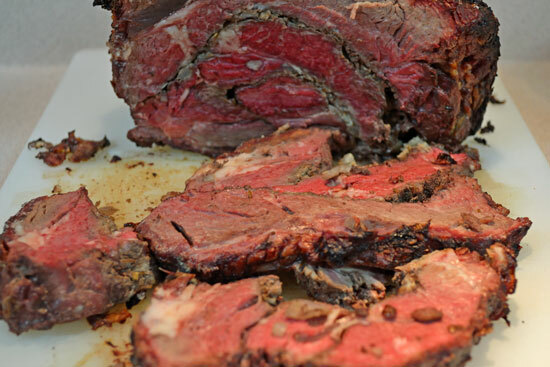 Once temperature is stabilized, roast beef for 2 - 2 1/2 hours, turning once each hour. 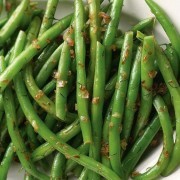 Roast until desired doneness, then remove and let sit on platter for 5 - 10 minutes. Slice and serve. Grass-fed beef will be tough and chewy if cooked to the usual USDA temperatures most of us are used to. The USDA recommends the beef be cooked to 145 - 170°F, while 120 - 140°F is best for pastured or grass-fed beef. 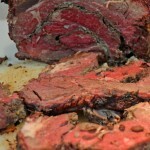 Shannon Hayes at www.grassfedcooking.com has taught me the most about bringing the rich and delicious flavors from these meats! We assembled all of the ingredients to start. A close-up view of the spices. I actually didn’t use all of them, but had gathered them when doing the brainstorming and adaptation of the original recipe. 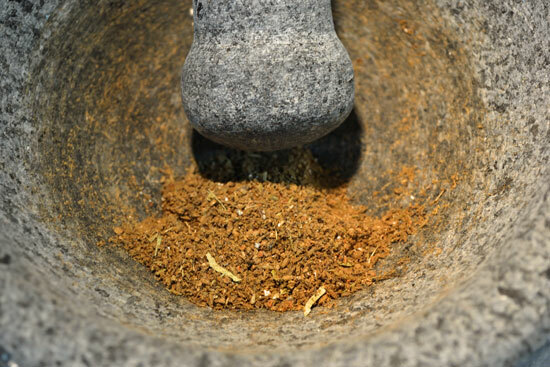 I prefer to hand grind my spices when I have the time, the flavor is much better, more defined and richer than with a blender or mechanical spice grinder. The crushing and twisting motion really does make a difference. We also found this applies to the flavors of pesto! There is green cardamom, star anise, caraway and cumin seeds in there. During the grinding process, the most amazing aromas drift up. Cindy had come in and commented on how wonderful it smelled already, and I was only grinding the spices! I ground the cardamom pods whole to begin with, then pulled the shells out after crushing them a bit to release their flavors. Next up was the garlic. I used the “Peel Garlic in 10 Seconds” trick, this time for the whole head. It still only took me maybe 15 seconds! The reason for grinding it instead of dicing or chopping it is to release the oils and flavors that only crushing or grinding will achieve. After mixing the marinade and butterflying the roast into about an inch thick roll, I applied the marinade and wrapped it back up. 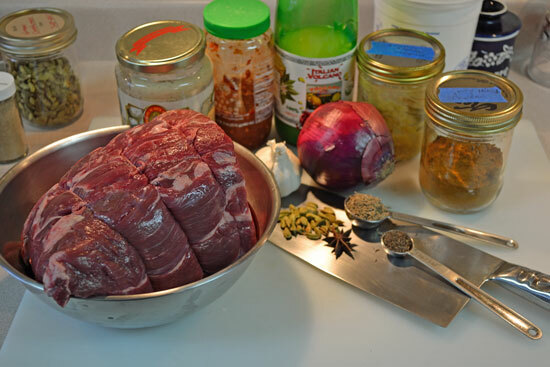 After liberally spooning the marinade on the inside and rolling it back up, I tied it with butcher’s twine, spooned the remainder of the marinade on the outside, put it into a bowl and then into the refrigerator for 4 – 5 hours to do it’s magic! That afternoon I fired the Kamado up and once the temperature stabilized, the roast went on. I had spread the coals to the outside and put a small round cast iron griddle underneath to divert the heat to be more indirect. Once the internal temperature was 125°F in the center, it was ready to let rest and then slice. Beautiful and mouthwateringly aromatic! It was hard to walk down wind of the smoker without popping the lid every time to check on it! Once it had rested for 5 – 10 minutes, I sliced it and we dug in. Of the 4 – 6 pound roast, 3 of us ate only about 1/4 of it, so there will be a number of other tasty dishes that result from this one.